Analyzing the Work of Your SEO Provider, Step 1, Keyword Research. This is the first part of a four-part Video series on how to analyze the work of your search engine optimization provider. We’re going to focus on this presentation mostly in the legal industry but a lot of these things are applicable to any kind of market that’s looking to utilize or is utilizing search engine optimization that drive leads to their business or law firm. 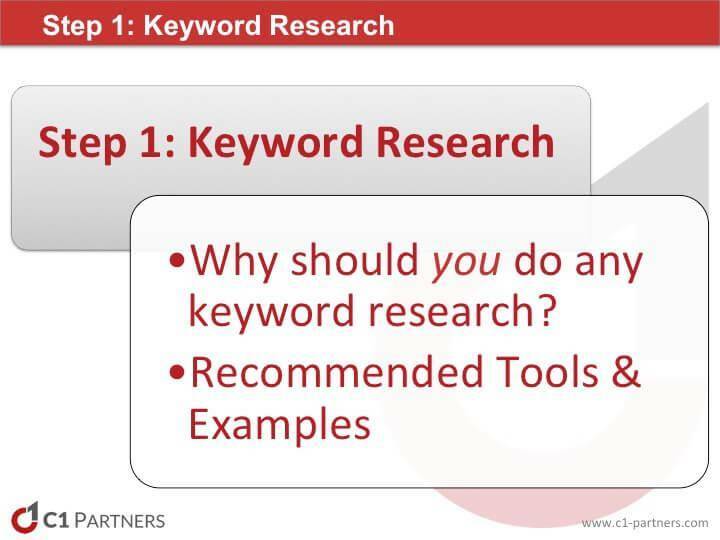 Video: Analyzing the Work of Your SEO Provider, Step 1: Keyword Research. First of all, why should you do any keyword research? You hired an SEO company. Why should you do that? Why do you want to spend time doing that? We’re going to talk about that. Recommended tools and examples: We’re going to show you the tools that we use and then in a separate video we’re going to have examples of how to use each tool, so look for that shortly. Why should you do any keyword research? First of all, you want to make sure you’re targeting the correct terms. We’ve run into this as an SEO provider where a client or prospective client gives us a list of search terms that they want to target. We look at that list and say that’s great. No one’s searching on these terms though. Your prospects seem to be searching this way. If you don’t build content and have a strategy targeting these direct keywords you’re not going to get any new clients from our SEO efforts. You definitely want to confirm that you’re targeting the correct terms based on search volume, relevance, your geographic market and maybe even your budget. Some SEO companies to look out for try to decide for you what terms they’re going to target, the bad ones may not have your best interest in mind. Maybe they’re trying to rank five of your competitors in the same market so they’ve divided up the search terms for each of the firms, or maybe they don’t really care to pinpoint specific terms for your firm. They’re going to target “X” number of handful of search terms for this law firm and they’re going to do this handful for another and they may not be looking out for your firm to be ranked for the best terms for your law firm. The other thing is search term strategies need to be updated regularly. Monthly we discover new ways in which people are searching online to find our business and when we find terms like that before our competitors that allows us to begin building content around those search terms and outranking our competitors much more quickly. We may find some terms that people aren’t using anymore for whatever reason. Remember, all of this is to make certain your SEO strategy is the right one. You don’t want to be an SEO expert, but if you can provide some input and ask questions of your SEO provider then you’re going to feel more comfortable that your search engine optimization effort and investment is going to pay off if it’s not paying off already. You don’t want to rely a hundred percent on your search engine optimization company to do keyword research unless you have some reason to just trust them a hundred percent which can be hard in this industry. Recommended tools and examples: What I’m going to talk about is the tools that we recommend here and then in a subsequent video presentation, it’s going to be a video of me walking through using Google Webmaster Tools that discover keywords, Google AdWords and Wordtracker. These are the main tools that we use. There are other ones out there. SEMrush is one that is becoming more popular. In fact, it seems to be now tied into Wordtracker, for example. Google Webmaster Tools is up and coming for us. We’re using this more and more especially as Google Analytics does not allow us to see what keywords people are using to find their website. Specifically with Google Webmaster Tools, now that Google Analytics, well, if you’ve looked at Google Analytics in the last year, you’ll notice that it doesn’t tell you for what terms people are searching when they get to your website. How do you figure that out? One way is to implement a Google AdWords campaign. We’re not going to talk about that here, but Google Webmaster Tools does a great job of giving you ideas for keyword research and showing you trends of how people are searching, finding your website, that kind of thing. One of the challenges with Google Webmaster Tools is that it only shows you a ninety day window and it may only show you a thirty day window of change. You have to go in there frequently and download information so you have historical data whereas Google Analytics historically would show you traffic data from the day you installed the Google Analytics code on your website. The other thing Google Webmaster Tools does is it provides a lot of other information that we’ll talk about in the next few sections with regards to onsite optimization and offsite optimization. It also will help with ranking information. This is becoming for us a very important tool for SEO, even more important than it was a year ago. One of the things I like about the Google AdWords tool is it’s a free tool that you can use, and you’re pulling data directly from Google. It can be good for providing general direction. It should be part of any overall effort for keyword research, but it’s not a hundred percent reliable. It seems like Google really doesn’t like to tell you everything that’s going on before you start spending money with them. It does show some trends though. If you really want to do the best job of keyword research then you should consider implementing a Google AdWords campaign that you’re paying for (PPC), if you can fit that into your budget and make it part of your strategy, it can be a very useful tool even if it’s a break even approach to marketing because you’re gathering a lot of data on web search trends convert from perks to leads to new clients. Google AdWords needs to be a part of your keywords research repertoire and you should at least consider paying for Google AdWords campaign, but be VERY careful and only under the guidelines I recommend with cost per client acquisition tracking at the keyword level for calls and/or contact forms. You MUST have an expert do it for you, especially in the legal industry, it’s very competitive. Attorneys waste thousands of dollars on bad Google AdWords, sometimes tens of thousands of dollars. It’s better that you utilize an expert who will be a hundred percent transparent with you and can show you examples of their successful Google AdWords campaigns for attorneys. For keyword research definitely check into Google AdWords, either the free version or setting up an account and having a paid version can be great. What I like about Wordtracker is it’s a very easy to use interface. The Google AdWords tool can be cumbersome, can be a bit convoluted, and I don’t always like how it presents the results. Same thing can be said for Wordtracker. In some cases I don’t always like how it presents results, but it is one of my favorite tools. They also have a database of their own “serch” data. You can choose to use that for keyword research and you can choose to use what is now the SEMRush database which I’m ninety-nine percent sure, they just started changing this today, but I’m ninety-nine percent sure that is AdWords data that SEMrush is pulling from Google. Unless I change this content in the near future we’ll just say that’s the case. The thing about Internet marketing is it changes day to day so what I say that’s true today might change tomorrow. Wordtracker provides good data-with their own data that they provide, it’s good data on how people are discussing topics online. It gives you great blog topics and tools to come up with topics you want to blog about and content you want to add to your website. Then, again, it does a very good job of presenting Google AdWords data although it looks like they’re going towards the trend of not showing a cost per click data from Google AdWords, which makes the Google AdWords tool even more valuable than it was before. There’s a free trial available with Wordtracker. I think you have to give them your credit card information for a thirty day trial. We, as an agency, have a paid version of that and soon I will be showing you a video. This blog post will be linking to a video of how to use the Wordtracker. That’s the end of Part 1. Part 2 coming up which is going to be Analyzing the Work of Your SEO Provider: implementing and using ranking analysis tools. Thank you very much and until next time, we’ll talk to you soon.